Abutilons in my garden, click to enlarge. 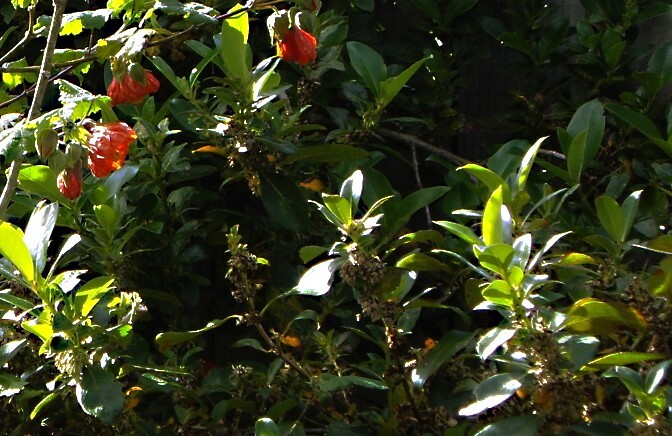 This is a photo of one of my favourite plants – abutilon, or Chinese Lantern flower. The orange flowers really glow, and you can see them from a long way away. But there are other flowers in this picture – there is a native shrub, whose name I don’t know, with shaggy insignificant flowers behind each leaf. These other flowers take a bit of looking for, and they’re not very pretty. But do you know what? These scruffy flowers get pollinated, and set seeds in orange berries, which by the way look quite good with the abutilons, but the birds love them! Net result, the seeds are spread everywhere- little shrubs sprouting up all over the garden, and even in the lawn. It seemed to me that God was speaking to me through these flowers. The showy orange lanterns are all very well, and arrtactive, but they never go anywhere. The humble little ones whose name I don’t even know are the ones which really go places. They are carried everywhere, and grow into persistent woody shrubs. Maybe the sort of celebrities who have very public charity work are like the abutilons. And maybe the sort of people who work quietly away in the background are like the shrubs – their work isn’t showy – it’s very mundane really, as they feed schoolkids, help addicts, care for children, teach Christian Religious Education and a myriad of other hands-of-Jesus ministries. It’s these ministries that bear fruit! Just as our shrub has lots of berries with seeds that are carried everywhere, so the Christian workers, which should be all Christians will bear fruit that carries, and spread, even if it isn’t obvious in the community. It’s a bit like the pharisees who give while blowing trumpets, isn’t it? This entry was posted in mission and tagged abutilon, body of Christ, Chinese lantern Flower, choosing to follow Jesus, christian life, christian religious education, garden, hands-of-Jesus, jesus ministries, nature, new zealand aotearoa, orange flowers, plants, revfelicity, spring, Wellington, woody shrubs by revfelicity. Bookmark the permalink.